Since I’m living with Celiac Disease an ulcerative colitis, I do my best to make sure my immune system is in the best shape it can be. I started taking a Vitamin C supplement long ago, and I make sure our family gets plenty of Vitamin C from food. Vitamin C helps to maintain healthy skin and gums, protect against heart disease, and aids in the absorption of iron – something folks with G.I. issues often struggle with. I found that certain supplements would upset my stomach, so I switched to Ester-C, a supplement that’s easier on my system. It’s made of Calcium Ascorbate, a unique form of Vitamin C that’s lower in acid and stays in your bloodstream for 24 hours. When the folks at Ester-C asked if I’d be willing to create a few recipes and talk about immune health (they’re sponsoring this post) saying yes was easy, because I already use the product. I take a 500mg tablet, but they also make fizzy drink mix and chewy gummies, all of which are non-GMO and gluten-free. 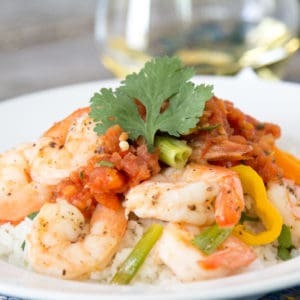 Here are 3 of my favorite recipes that are packed with Vitamin C: Oven Roasted Shrimp with Sweet Peppers, Simple Roasted Salsa, and Strawberry Pineapple Whip Smoothies. I’m sure they’ll become some of your favorite recipes too! Perfect for a quick meal or an easy appetizer, these easy Roasted Shrimp with Sweet Peppers are packed with flavor and Vitamin C from the lemon and peppers. The pan drippings make a fabulous sauce for pasta, rice or salads. In a large bowl, toss the shrimp with 2 tablespoons of olive oil, green onions, peppers, lemon slices and the salt & pepper. Add a bit more olive oil to coat of needed. Arrange the shrimp in 1 layer on a rimmed sheet pan, ensuring that the peppers and lemon slices are spread evenly throughout. Roast for 8 to 10 minutes, just until pink and firm and cooked through. Roasting the ingredients for this easy salsa provides deep flavor without much work! 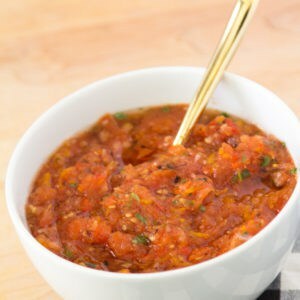 In addition to the Vitamin C from the peppers and tomatoes, this salsa is packed with lycopene, an antioxidant that wipes out free radicals. Heat the broiler, with the oven rack in the top position. Arrange the tomatoes, onion bottoms and peppers on a rimmed baking sheet. Broil the vegetables until they soften and the skins are charred on one side, then carefully flip and broil on the other side. Allow vegetables to cool, then remove the stems and seeds from the peppers. Add the roasted vegetables, cilantro, salt and pepper to the bowl of a food processor or blender and puree to desired consistency. Serve over shrimp, and store any remaining salsa in a sealed container in the refrigerator for up to 3 days. Did you know strawberries contain more Vitamin C than oranges? It’s true! 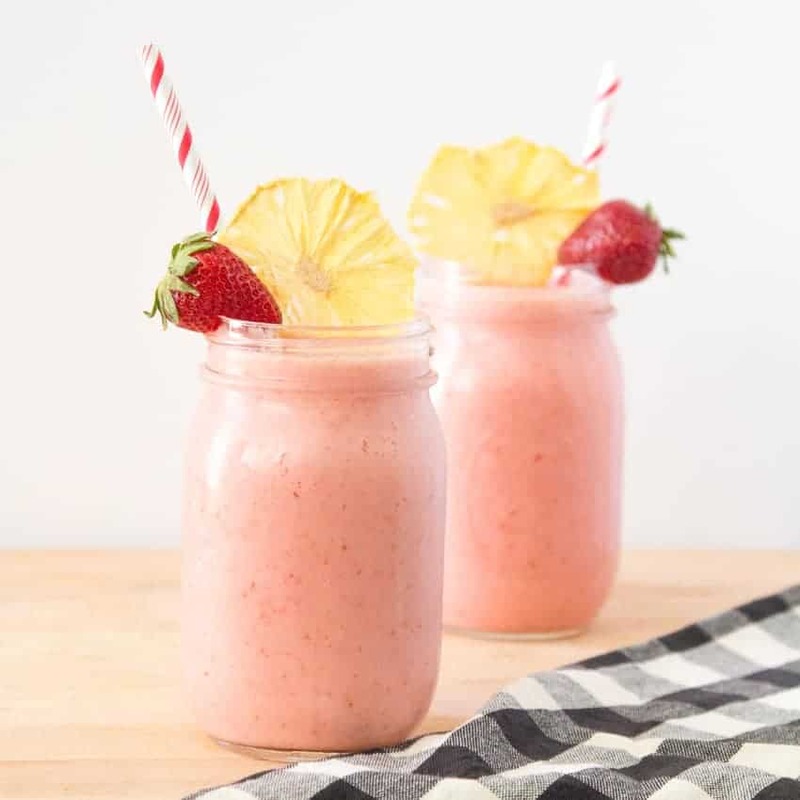 This strawberry-pineapple smoothie packs a Vitamin-C punch, plus bromelain (which fights inflammation) from the pineapple. If you’re careful to add just enough coconut milk to blend, this drink has a similar texture to the Dole Pineapple Whips found at Disneyland! Add the frozen fruit and honey to the pitcher of a high-powered blender, and add enough coconut milk to cover completely. Blend on high, adding more coconut milk as needed to blend. Pour into serving glasses and enjoy. The folks from Ester-C sponsored this post. All words and ideas are my own. Thank you for supporting the brands I work with, which allows G-Free Foodie to grow. This entry was posted in Articles, G-Free Foodie Product Reviews, KC's Blog and tagged celiac health, dairy free, dinner, G-Free Foodie, gluten free, immune health, immune system, kc cornwell. Bookmark the permalink.